Dark clouded yellow Colias croceus, photographed by Hans Hillewaert. Colias, the clouded yellows, is a subcosmopolitan genus of butterflies with larvae feeding on Vicia species and other Papilionaceae. 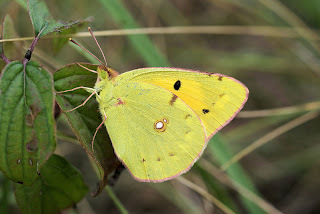 The dark clouded yellow C. croceus is widespread across most of the Holarctic region; in the western part of its range, it breeds in northern Africa and southern Europe, migrating into the northern parts of Europe over summer. [B08] Bálint, Z. 2008. Lepidoptera collections of historical importance in the Hungarian Natural History Museum. Annales Historico-Naturales Musei Nationalis Hungarici 100: 17–35. [F55] Franz, E. 1955. Die Typen und Typoide des Natur-Museums Senckenberg, 16). Insecta, Lepidoptera, Pieridae. Senckenbergiana Biologica 36: 339–367. [FS54] Franz, E., & H. Schröder. 1954. Tagfalter (Lep. Rhopalocera) aus El Salvador. Senckenbergiana Biologica 35: 75–87. [K09] Krantz, G. W. 2009. Habits and habitats. In: Krantz, G. W., & D. E. Walter (eds) A Manual of Acarology 3rd ed. pp. 64–82. 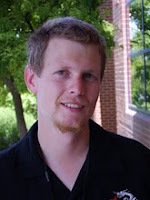 Texas Tech University Press. Last updated: 20 August 2017.